A spinning wrench is a good substitute for rotary rope or chain. It is an oil drilling tool used to offer mechanical advantage in applying torque to turn objects. Our spinning wrench is designed and manufactured in accordance with API Spec 7K "Specification for Drilling Equipment". It is applicable to pipes with a wide range of diameter. 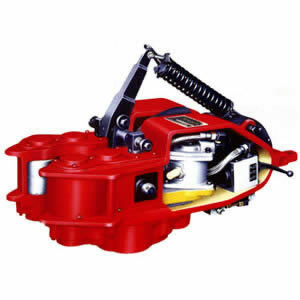 There are two configurations for clamping mechanism, which are air tyre and air cylinder. Two driving and controlling styles are also available: pneumatic and hydraulic. Rugao Yaou Company is a China-based spinning wrench manufacturer. Featuring reliable performance and great durability, our oil drilling tools are extensively used in Turkey, India, Singapore, Australia, Brazil, among other countries. To better suit the needs of market, we also produce well cement tools, workover tools, and solid control equipment. For more information, please contact us directly, or browse our website.